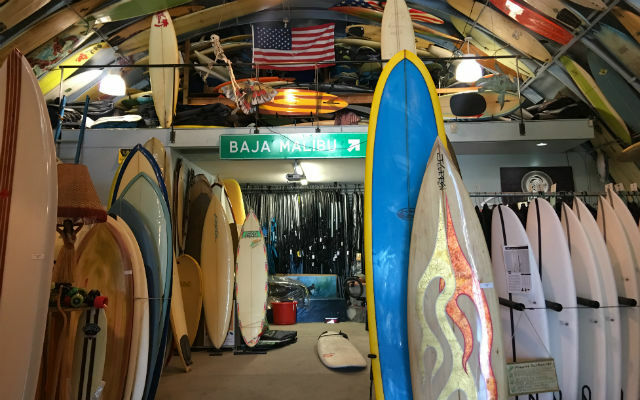 If you’re looking for a truly unique San Diego experience then read on to find out how Bird’s Surf Shed has become a place that both locals and global travelers call a destination for surfing history, culture and authenticity. Before social media, before Facebook and Instagram, there was Bird’s Surf Report. I’ve heard Eric “Bird” Huffman on many of San Diego’s local radio stations over the years. But I had to get a closer look at what he was up to, so I drove over to Bird’s on Morena Boulevard to talk to the man himself. Bird saw me patiently waiting and we got started chatting. As we got into the interview Bird told me that he’d been doing the surf reports on radio stations as far back as the 1970s on KCBQ, KGB, KPRI and eventually 91X. Bird explained that before Surfline, surfers would call surf shops for the surf report. None of the older guys wanted to do it, but Bird was young back then and didn’t mind. Eventually radio stations found him and caught onto his smooth delivery and accurate reporting that led to a more consistent presence on air. Well, looking around I could see how true that was. “Surfboards are my passion,” Bird told me. There are over 1,000 surfboards at his store. You can borrow them, buy them or just admire them. If you live in San Diego and appreciate the San Diego lifestyle, Bird’s Surf Shed is a must visit for one of the most unique San Diego experiences. Blair Giesen is a San Diego-based media and marketing consultant and startup business enthusiast. His column, The Local – Businesses & Strategies That Count, appears bi-weekly in Times of San Diego and explores the stories of local San Diego companies that are doing amazing things. If you have a company you think is doing something amazing, send him a message or connect on LinkedIn or Twitter.